MIAMI — A monster Hurricane Irma roared into Florida with 130 mph winds Sunday for what could be a sustained assault on nearly the entire Sunshine State, submerging streets, knocking out power to millions and snapping construction cranes over the Miami skyline. The 400-mile-wide storm blew ashore in the morning in the mostly cleared-out Florida Keys and then began a slow march up the state’s west coast. Forecasters said it could hit the heavily populated Tampa-St. Petersburg area by Monday morning. “Pray, pray for everybody in Florida,” Gov. Rick Scott said on “Fox News Sunday” as some 116,000 people statewide waited it out in shelters. Irma struck as a Category 4 but by late afternoon had weakened to a Category 2 with 110 mph winds that whipped Florida’s palm trees with drenching squalls. A storm surge of over 10 feet was recorded in the Keys, and forecasters warned some places on the mainland could get up to 15 feet of water. Many streets were flooded in downtown Miami and other cities. Appliances and furniture were seen floating away in the low-lying Keys, though the full extent of Irma’s fury there was not clear. 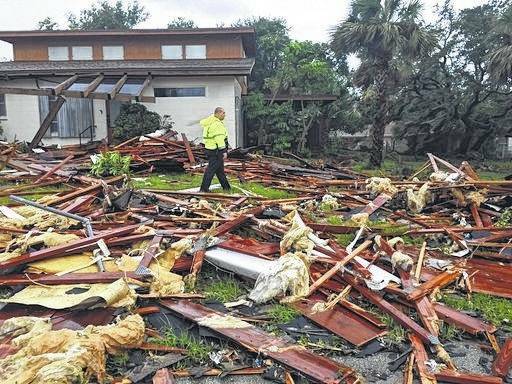 An apparent tornado spun off by Irma destroyed six mobile homes in Palm Bay, hundreds of miles away along the state’s Atlantic coast. Flooding was reported along Interstate 4, which cuts across Florida’s midsection. More than 2 million homes and businesses across the state lost power, and utility officials said it will take weeks to restore electricity to everyone. While the projected track showed Irma raking the state’s Gulf Coast, forecasters warned that the entire state — including the Miami metropolitan area of 6 million people — was in danger because of the sheer size of the storm. Irma made landfall just after 9 a.m. at Cudjoe Key, about 20 miles outside Key West, forecasters said. During the afternoon, it rounded Florida’s southwestern corner and pushed toward Naples, Sanibel, Fort Myers and, beyond that, Sarasota, at 14 mph. Its hurricane-force winds extended 80 miles from its center. Meteorologist Ryan Maue of WeatherBell Analytics said the entire Florida peninsula will be raked by Irma’s right front quadrant — the part of a hurricane that usually brings the strongest winds, storm surge, rain and tornadoes. The Tampa-St. Petersburg area, with a population of about 3 million, has not taken a direct hit from a major hurricane since 1921. The wind began picking up in St. Petersburg, some 400 miles north the Keys, and people started bracing for the onslaught. Forecasters said a weakened Irma could push into Georgia, Alabama, Mississippi, Tennessee and beyond. A tropical storm warning was issued for the first time ever in Atlanta, some 200 miles from the sea. With FEMA still dealing with the aftermath of Hurricane Harvey in Houston, Irma could test the agency’s ability to handle two disasters at the same time. Palm Bay officer Dustin Terkoski walks over debris from a two-story home at Palm Point Subdivision in Brevard County, Fla., after a tornado touched down on Sunday.